Hello guys! Finally I'm starting a new mini layout. As mentioned in the title, it will be an industrial layout. I'm thinking on a size of about 90x60cm. 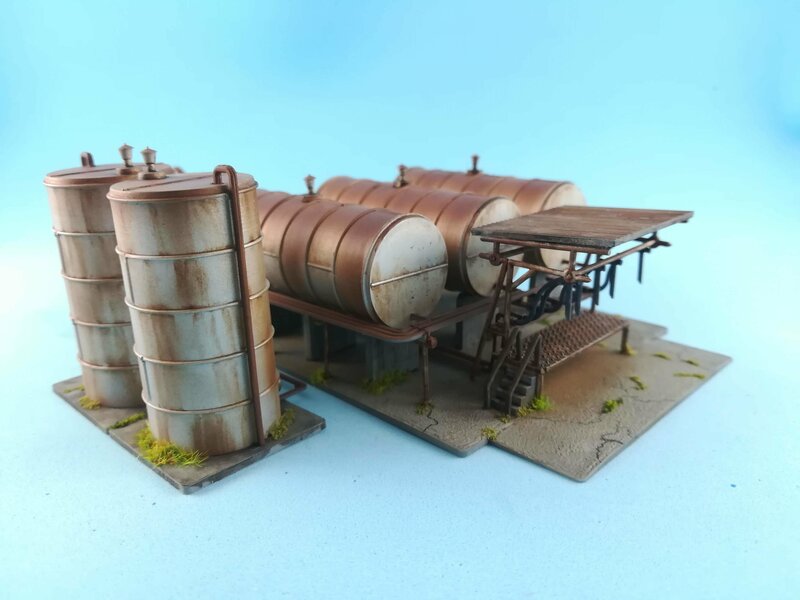 As base I´m using the Greenmax factory kit and additional pipes kit and the Walther's North Island Refinery. I'll define the layout later as I'm just starting with the buildings and will play a liitle with their position to define the track position. Another thing I'm considering is to light all the complex using fiber optics, but it will be a process that'll take pretty much time to do, so it's still in consideration. The running material will be a DE10 and some Takis. I'll see as I go along. Well, as always any ideas or opinnions are most welcomed. Look like you're already off to a good start! I'm excited to see how this layout progresses. Oooohhh this is gunna be good! 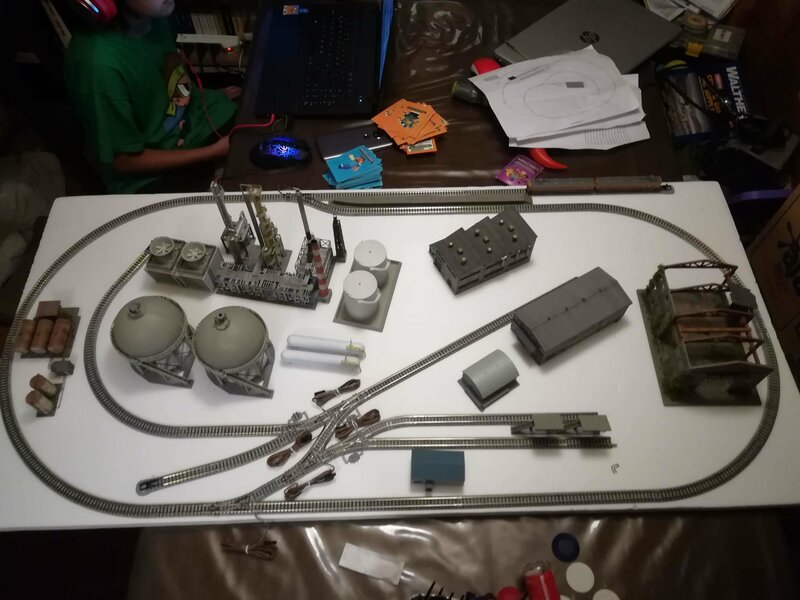 Here is a photo of my little industrial themed layout. It measures 14 inches (36cm) by 19 inches (48cm) and is housed in a box. Tomix track was used. Hello guys! Little update here. Keep working on scenery buildings so I can get all together and finaly trace the layout. The facility is the Walthers cornerstone Fuel loading rack, wich I represented disused. 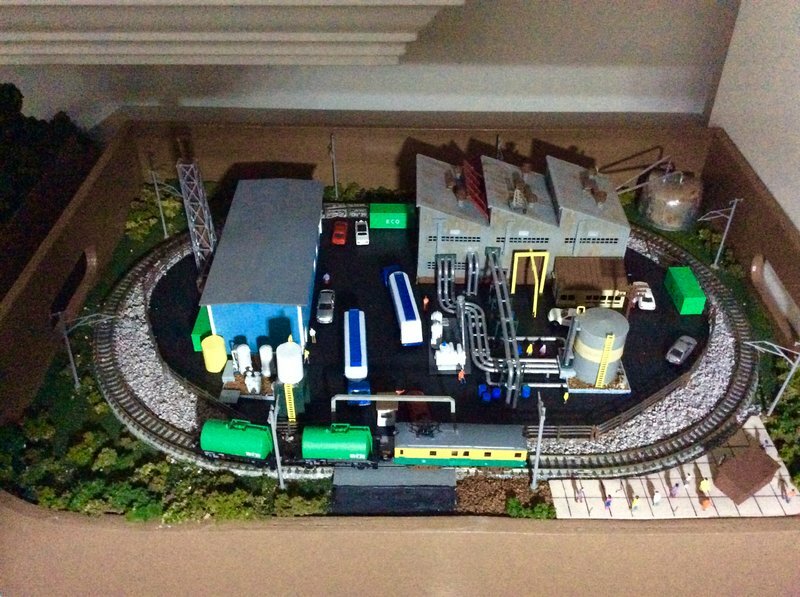 The kit also has a warehouse wich I intend to convert to an engine shed. Speaking of wich, anyone know of any available switcher wich can be bought thru Hobby Search or hlj? I'm buying a DE-10 and some TAKI1000 to operate on the layout but can´t find any switcher. Anyway, I hope you guys like the model so far. 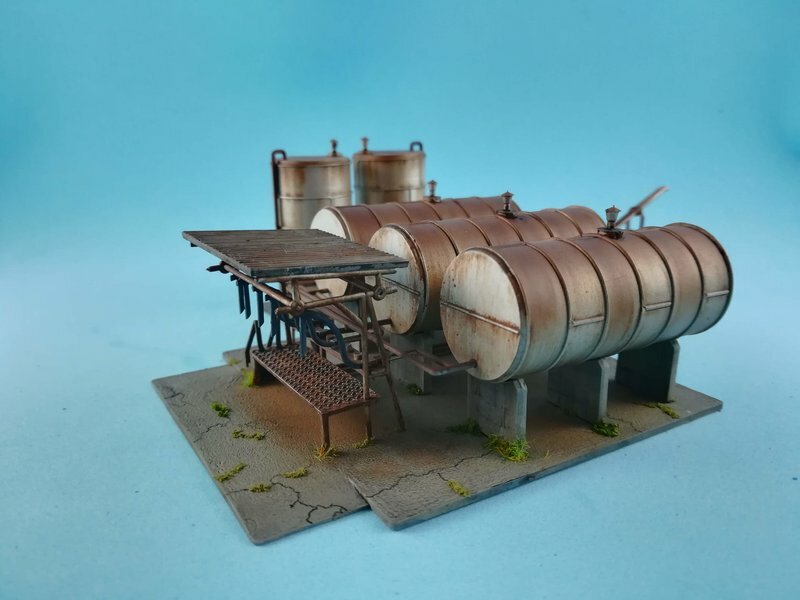 Wow, amazing work on the weathering! I'm pretty sure the DE 10 can also be used as a switcher, but the DD13 kato recently released would also make a good switching engine for an industrial area as many are now in private hands working switching and light moves in industries. I recently got one and it already is one of my favorite locos . as always, kudos! Your modeling skills are fantastic! 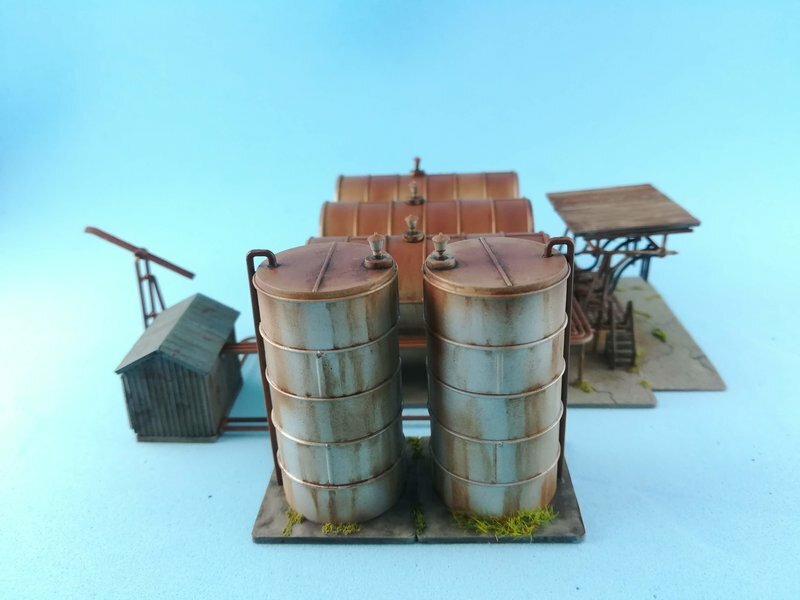 I really love the weathering that you have done there, with the rust effect on the tanks did you use drybrushing to get it like that. Here is a shot of one I saw in action at Hayahoshi on the Takayama Honsen last year. Thank you for your comments guys! Very much appreciated! About the switchers, both look very nice. I´ll have to decide on wich one to go. 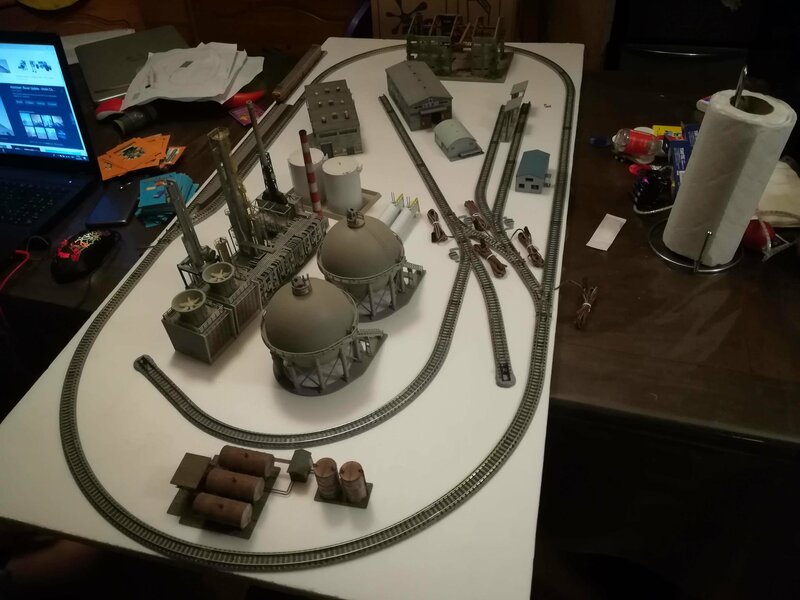 Do you have any ideas on the track plan for your industrial layout? I am about to start building a traverser I can use to operate small layouts almost without electrical complications. Hi Pablo! I only have an aproximate idea on what will be, depending also on the organization of structures. The ideal would be 90x60cm but i'm starting to wonder if that would be enough. Maybe an oval with one or two tracks entering, one of wich will end on two loading terminals and an engine shed for the switcher. The idea would be that the outer line has also a local passenger line, as to break a little the monotony of the industry. But all is in my mind for now. I didn't know what is a traverser, so googled it and looks interesting. I wold like to see what you have in mind. I am looking at the Carl Arendt mini-layout website for inspiration. Maybe the "Deep in the Georgia Woods" plan in this page could be useful for you http://www.carendt.com/micro-layout-design-gallery/traversertransfer-table-lines/. The idea is with a traverser you only need to build half of a turnaround in your scenic area and still have two or three industrial sidings and a small platform for a one or two car passenger train to come from time to time. The traverser tracks can also work as yard storage for a variety of rolling stock coming in and out. There are plenty of other ideas in the design gallery http://www.carendt.com/micro-layout-design-gallery/. Wow! Very interesting site! The industrial layout will be a stand alone oval-shaped with the switching work on te inside and no extra room. But, I'm also planning to build modules for the longer trains and the traverser track system sure put a new perspective for the design, so thank you for that! Are you publishing the progress of your traverser? I'm really interested to see it. bit more in the posts around this. I already got two sets of 30 cm drawer slides which are the heart of the traverser. They come out 27cm on each side and they are very solid steel so they will also provide structural strength. I am in the process of getting some timber to build the frames and the baseboard. Hopefully I'll get that done sometime next week. I plan to use Toni's approach for electrical connection. You will find a nice video is you click in Kabutoni. I am planning two traversers to feed a double track main line in one side and the same double track plus a freight branch on the other. So I will need 5 of the adjustable track pieces! But well, this way my trains will run in the correct track and the correct direction. Guys, that looks great! Very interesting info there. I have to buy some points in order to start to work modules as I plan to make a station first. 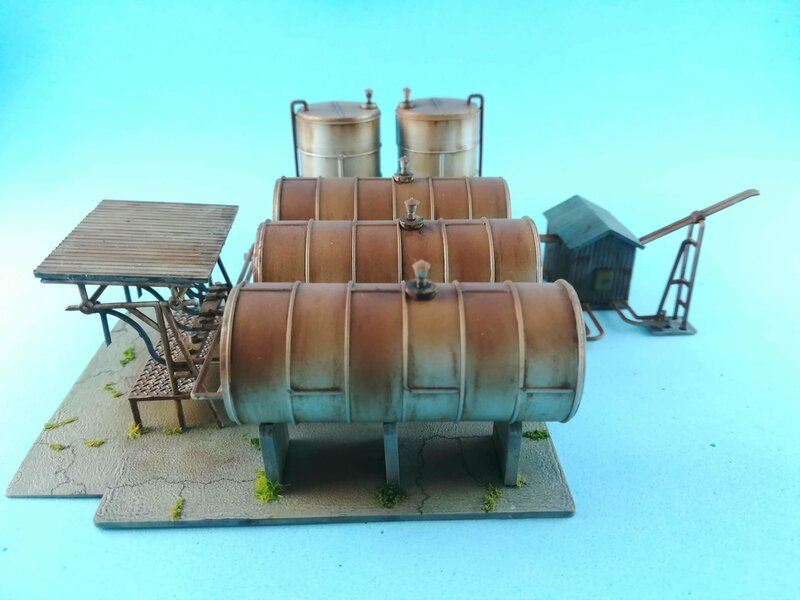 On the industrial layout I'm using most of the mini-point I have. 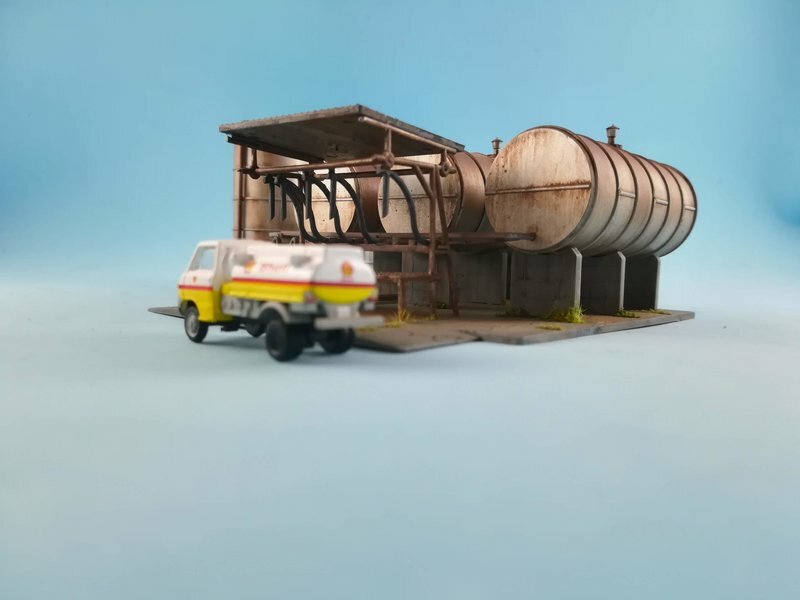 Also ordered the new tomytec warehouse https://www.1999.co.jp/eng/10279826 and the Tomytec factory ruins https://www.1999.co.jp/eng/10513041 as to match it with the disused fuel loading rack I posted before. Again thank you for the info! Today I'll try to build it and see if I can accomodate the tons of structures I've been building for it, wich are mostly large, so it'll be quite a challenge.🤨 I'll keep you posted. OK! So, here's a try at the look of it. 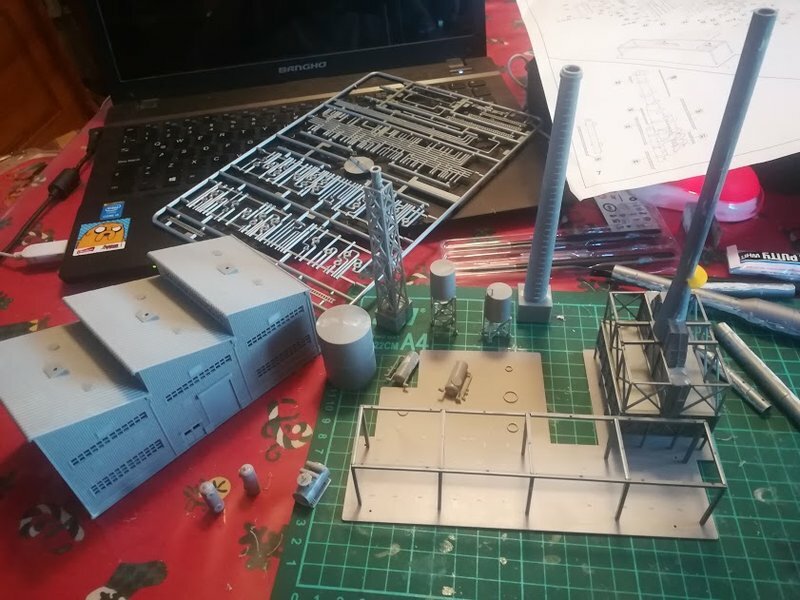 Saddly, the abandoned factory building is way too big for the layout. The location of the elements is not final, I'll play a little more with it. Imagine also all the pipe work around the facilities. Any suggestion more than welcome! That's going to be great! The loop itself can work as a run around to make operations interesting. I can think of at least on real-life example in Japan. 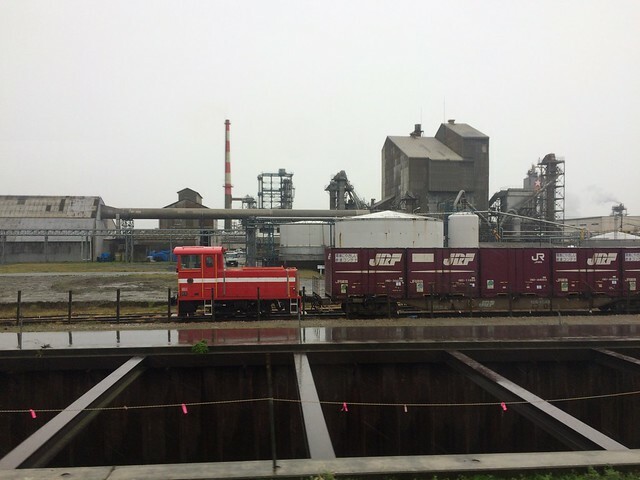 That's at the end of the Umi-Shibaura branch of the Tsurumi line https://goo.gl/maps/ae6PM8XjsKs. Looks like a great plan with some interesting shunting options. I was wondering whether you needed a passing loop with a head shunt so that you could bring a loco around to the other end of the wagons. I know the loop would do the same thing and space is obviously a challenge. I was hoping to add something similar to this once I finally get in gear with my layout. There's a Mitsubishi chemical site up the line from me in Kurosaki. Every day at around 3:00pm there's a delivery of 3-5 Koki 200s with Nitric Acid containers that get dropped off usually by an ED76 travelling West to East. The Kokis are set down in one of the sidings next to Kurosaki station awaiting the works D353 to come and push them back into their cargo yard. Sorry if you’ve done this already but some tips on trying to get close to your beautiful weathering would be very welcome. Stunning work! Thank you guys! Very valuable information! I'm still trying out options, so everything comes in handy. After taking the pics yesterday, tried out the layout with the DE10 and a couple of TAKI1000. It worked pretty well, except for an area wich remained unpowered when moving the switch for obvious reason when watched what happened. My question is: do I have to add another power line on the marked area or should I re-design that part of the layout? I'm glad you like it! Thank you! On the weathering can give you lot of tips, but maybe would be easy if you show me some specific item? I tend to use many techniques depending on the effect I want to achieve. Please PM me or tell me what can I help you with, I'll be very happy to do it.